If you are looking for a burger that you can barely fit into your mouth and has so many amazing flavors look no further. This is probably this best burger that I have ever had in my life. Seriously. The best part is you can swap out the meat patty for a veggie patty and make it vegetarian friendly! 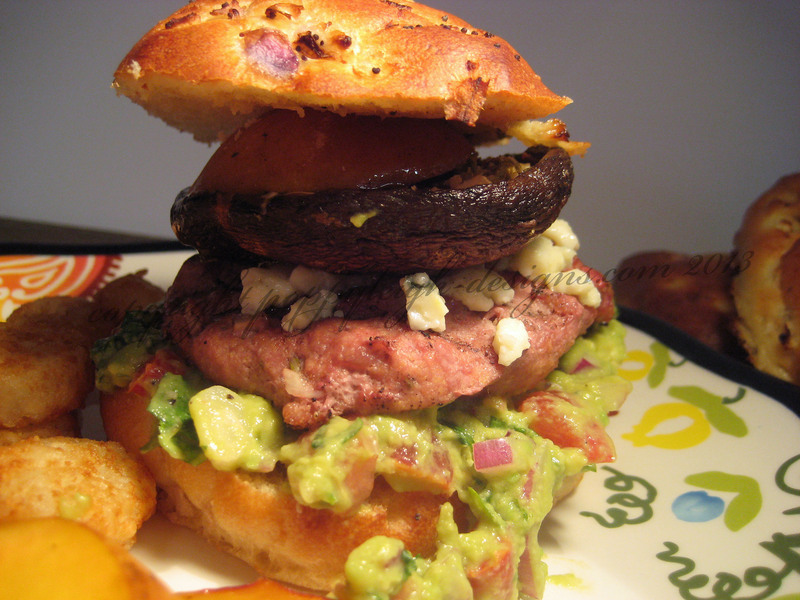 This has a turkey burger, grilled portobello mushroom, grilled peach, and crumbled blue cheese. Oh yeah, and I almost forgot there’s guacamole too. What doesn’t this burger have? Serve with some tatter tots and you have yourself one amazing summer meal! 1. Begin by turning the oven on to 425 degrees, then slice the peach into thick pieces, crumble the blue cheese, wash and dry the portobello mushrooms – set aside. 2. Mix the olive oil, crushed thyme and rosemary, crushed garlic, and dash of salt and pepper – stir to combine and spoon half over each portobello. 3. In a small bowl place the turkey meat and pour the remaining olive oil mixture and mix well. Add additional salt & pepper as well as some onion and garlic powder. After mixing form the turkey patties. 4. For the guacamole: Open the avocados, mash the flesh in a small bowl add the chopped tomato, onion and cilantro, squeeze the lime, and add the salt, pepper, garlic powder and onion power – stir to combine. 5. Start the BBQ and put the tatter tots on a baking sheet in the oven and bake for 25-30 minutes. 6. Place the peaches and portobello mushrooms on the center of the BBQ for a few minutes until they have grill marks, then move to the sides; cook for about 5 minutes before putting the turkey patties on the grill. Place on the center of the grill for a few minutes until they have grill marks and then move to the sides. Cook the burgers until they are cooked through and the peaches/portobello mushrooms until they are soft. 7. Toast the buns if you’d like. 8. To assemble: On the bottom bun spoon out a heaping spoonful of the guacamole. Place the turkey burger on top and then sprinkle the crumbled goat cheese on the burger. 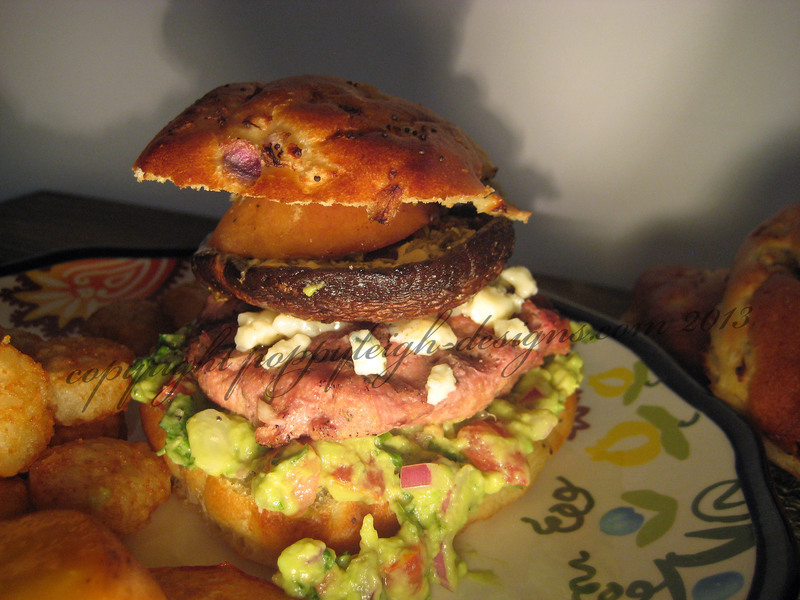 Add the grilled portobello mushroom, the grilled peach, and then the top of the bun and press as flat as you can! 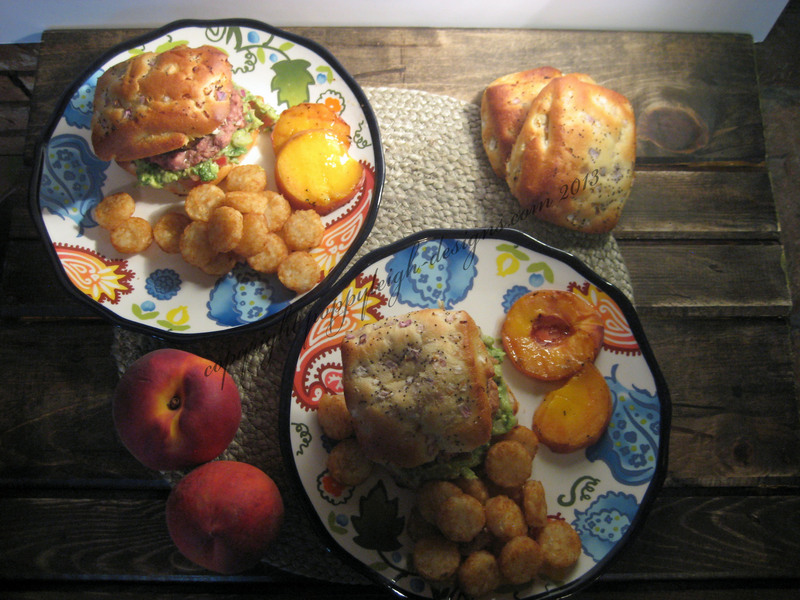 Serve with the baked tatter tots and any extra grilled peaches. Yummy!! This is a fantastic light and moist “cake” and is perfect for a summer breakfast or dessert. Serve with your favorite yogurt and fruit or ice cream. 1. Preheat oven to 350 degrees F. Butter or spray a 9-inch baking pan. 2. Slice peaches and arrange in the bottom of the pan without any gaps. 3. Mix together the flour, baking powder, and salt in a small bowl and set aside. 4. In a larger bowl cream together the butter and sugar on high speed for 2 minutes. Switch to a whisk attachment and beat for 3 minutes more at high speed, scraping down the sides of the bowl when needed. Add in the eggs one at a time and then add in the vanilla. Add in the flour mixture and beat just long enough to eliminate any lumps. 5. Spread the batter over the fruit in the pan. 6. Place the pan on the oven rack in the middle of the oven and bake for 45 minute until golden brown. 7. Let cool slightly, then turn over onto a plate, serve warm to cool.